The last garment to my 3 piece suit, I guess the appropriate name would be the Summer Suit, the jacket was made in June, the skirt in July and finally the pants in August. The biggest hang-up that was keeping me from sewing the pants sooner was the fly front zipper insertion. Every time I thought about sewing Simplicity 2700 I would get nervous about the zipper application, yeah... I’ve made pants in the past, but they were elastic waist and the 3 other pairs that had zippers did not have the best zipper insertion, so they don't count. Finally, last week I decided it was do or die and began working on my pants realizing the best way to tweak S2700 was to use existing pants that fit perfectly. For years I have had a hard time finding pants to fit my body, especially having a short torso, short crotch depth, narrow hips and a flat booty until The Loft introduced pants that fit various body shapes and I was in total heaven. I love their Marisa style, which is a wide leg silhouette and sits low on the waist, but at $79.00 a pop, I knew it was time to grasp the handles and make my own. 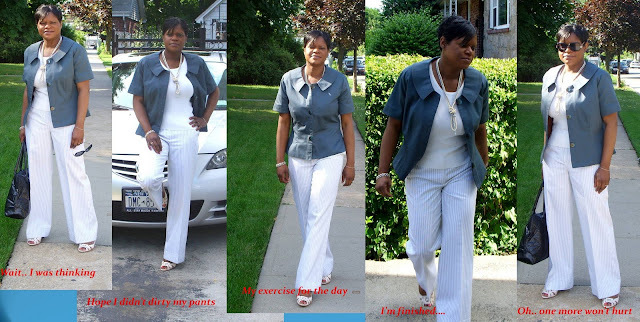 With that I combed my closest and came across pants that I’d purchased 2 years ago from there, but never wore (the fit was perfect, but realized the Capri style worked against my height and totally forgot to return them.] I took the task of tedioulsy taking them apart and placed the disassembled Loft pants against the pattern pieces amd tweaked the pattern according to my rtw pants. 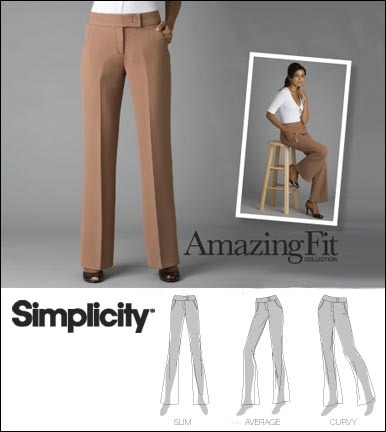 Simplicity 2700 is a trouser style pattern with back darts, side pockets, bootleg cut and a wide waistband. I love trouser style pants and like the idea of Simplicity offering different body type styles and after measuring myself as best I could, I decided the slim closely represented my body type. I must say by offering different body type styles, it minimized my fitting issues, in that it was a matter of removing a few inches from the waist length, tweaking the crotch according to my rtw pants and removing excess fabric from the back yoke, which I did after the pants was assembled since I was unable to foresee it. As I'd predicted the fly front zipper application put me in a state of befuddlement, my brain couldn’t process the instructions. Thereafter I reviewed several DvDs from my reference stash that entailed zipper applications without success. Most of the tutorials involved zipper insertions wherein the fly front is part of the pants front which left me still wondering how to attach the fly front and zipper shield. I continued searching the web and finally found http://cyberseams.com/. Their tutorial was a tremendous help in showing me how to insert the fly front zipper & shield. Once the the fly front, zipper and shield were inserted the pants came together quickly, I think even more so because I omitted the pockets. I really wanted to focus on the zipper insertion and didn't want to spend time fussing with pockets. Also I didn't use bias trim for the inside waistband and thinking for the next pair I will give it a try and lil tweaking of the waistband, I found it to be a tad bit too wide for my short torso. I am in HEAVEN I tell you, the pants fit comfortably, they did grow a little during wear, but it didn't take away from the overall look.... I think I could do a lil better on the fly front, but it didn't keep me from prancing around all day feeling like I'd hit lotto.... seriously to sew pants that fit my body... its a challenge. Ok... what else can I say about this pattern... there are 19 reviews on patternreview.com, I will be making another pants pronto, I love my pants, and thinking this pattern could become a TnT. S2700 w/ B5235, finally the start of a cool morning. S2700 minus the Jacket after about 7 hours of wear. B5235 w/ M3830 that day it was extremely hot and I was so tired.... I could barely stand long enough to take a pic. B5235 w/ rtw garments, I was totally feeling the jacket... it is the perfect topper for any rtw garment. Conclusion: B5235, M3830 & S2700 are perfect pieces to create a workable ensemble for work or play. Very nice ensemble! You did a terrific job as always! I do understand, making pants to fit my body is a challenge also. I think you did a jam up job. I've tried S2700 I think twice. I can do a front fly zipper pretty well, but the one I do is without the shield. I guess then it's called a mock front fly - I'm not sure though. As I remember, that pattern's pockets consists of about five pieces, which was over the top for me. The waistband really gave me a FIT! I've been promising myself that I'm going to get back to S2700. I need to do that real soon. Your suit is perfectly stunning! I think it was inspired to take apart a pair of pants that fit and use them with the Simplicity pattern to get the fit that you liked. Now that you've completed the summer suit, I'm sure there will be no stopping you from making future pantsuits and I can't wait to see what comes out of your sewing room! Great fitting pants, I see many more pairs for your wardrobe. Also, that jacket is the best, it always looks fantastic. These pants look great. It's wonderful when you find a good pants pattern. I am close, but still need to tweak my pattern. I am very envious of yours! So many bloggers struggle with trousers, so milk this patter for all it is worth! They look fabulous. Great look ....Sheila are you sure you weern't a model in a past life. lol All your pics look great. Your 3 piece is so stylish and timeless. I've been planning on a skirt suit, nut that was smart adding the pant! The pants are great inside and out! Nicely done! I am happy it worked out for you. I think I may give this one another try. Wow outstanding job....This is so beautiful! WOW! What an awesome job on those pants, what a perfect fit!! Your ensemble looks great. You go GIRL! Ms. Sheila - looking great! Oh wow... the pants fit very well! Great summer suit!! You're always so stylish! Great summer suit. You conquered the fly zipper and the pants is addition to the wardrobe. Hey nah, your whole get-up is soo classy! I've got to try these pants, yours are so lovely. Definitely a tnt for you, the fit is perfect. All very nice pieces! You always do wonderful work. You know what, I finally bought B5147. I already have a piece of fabric I'm going to use for the dress. FANTASTIC!! What a great wardrobe. I am stuck on a Simplicity pants zipper at the moment too! Great job on your pants they fit you so well! Everything looks wonderful on you as usual. I knew you could do it, that suit looks awesome, Ann Taylor eat your heart out. I love your pants. You've totally inspired me. And thanks for pointing out that tutorial. Great pants and you are really working that jacket. You've got a really good wardrobe. your clothes fit you really well and you have a real eye for design and what suits you perfectly. Those are great pants. Congratulations on getting such a perfect fit! Since I am not a muslin type of gal, I figured the best approach was taking apart rtw pants for a good fit and glad I did. Adrienne & Victoria Thanks for the links. Great pants and perfect summer suit! I have that pattern and haven't attempted them yet. I'm not scared of the zipper (yet). I'm tired of trying to get pants to fit. I just need to jump in! The pants looks very elegant and makes a beautiful figure! The fit is perfect! Wow, Sheila, what a great job -- they look wonderful on you! How sensible, too, to use the RTW pants to make the fitting easier so you could concentrate on the fly front. Great fitting pants!!! I have a pair of pants from Talbots that fit really well. Since they now have an unfixable hole in them, I'm taking them apart to make a pattern. Since they are side zip, no pesky fly front!! Great job, the pants look great on you (perfect fit) and the finishing inside looks very professional!